In anticipation of the annual Congressional Veterans Commendation ceremony on Saturday, November 1, I encourage 3rd District constituents to show their gratitude to all our veterans by attending this special event. The program will include a reception with veteran honorees and a book-signing with best-selling author Alvin Townley. North Texas is home to many veterans, and it’s important that we take time out of our busy schedules to thank these brave men and women for their service and sacrifice to our Great Nation. Our veteran honorees faithfully served their country, and they continue to serve as civilian leaders. They truly are our hometown heroes, and I look forward to paying them tribute on November 1 with our community. I am also thrilled to announce that best-selling author Alvin Townley will be our event’s keynote speaker. I’ve had the privilege of working with Mr. Townley on his new book, Defiant, which was released earlier this year. He is a man who shares a deep appreciation for our Nation’s veterans and believes in the importance of passing down their inspirational stories to future generations. 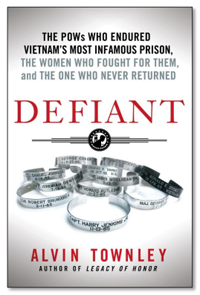 Townley’s book relates the story of the eleven American POWs known as the “Alcatraz 11,” who the North Vietnamese expelled from the infamous Hanoi Hilton for their extraordinary leadership and bold defiance. The book also tells how the wives of these eleven men founded the POW-MIA Movement and rallied a divided nation behind a common promise to POWs: You are not forgotten. I hope to see a large community turnout at the ceremony as we publicly recognize the wartime sacrifices and peacetime community involvement of Collin County veterans. Let’s show our veterans how much we care in a tangible and personal way. Alvin Townley will be available for interviews.